Historical insight is the alchemy that transforms the familiar story of the Gold Rush into something sparkling and new. The world of the Gold Rush that comes down to us through fiction and film—of unshaven men named Stumpy and Kentuck raising hell and panning for gold—is one of half-truths. 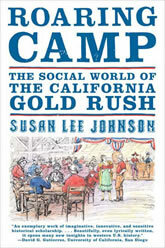 In this brilliant work of social history, Susan Johnson enters the well-worked diggings of Gold Rush history and strikes a rich lode. She finds a dynamic social world in which the conventions of identity—ethnic, national, and sexual—were reshaped in surprising ways. She gives us the all-male households of the diggings, the mines where the men worked, and the fandango houses where they played. With a keen eye for character and story, Johnson restores the particular social world that issued in the Gold Rush myths we still cherish.